A top Google executive says he’d love to build a city from scratch - without the messy humans getting in the way. Speaking at a conference, Sidewalk Labs CEO Dan Doctoroff first reminded the world that Google’s parent Alphabet was “the single most ambitious company that ever existed” apart from perhaps the Dutch East India Company, which “had the power to wage war”. Doctoroff, a former deputy mayor of New York City, then mused how nice it would be to start from scratch: a new city would be “a laboratory to experiment” with privacy and security issues. This would be a utopia free from “politics”, and “people with vested interest”, presumably meaning people who want to regulate Google. Sidewalk is one of Alphabet’s speculative projects. But it has won a real world contract – NYCLink – to install thousands of Wi-Fi kiosks in New York. Much of the push behind "smart cities" involves delivering efficiencies to owners at the expense of the freedom and autonomy of its citizens. For example, "smart power grids (sic)" will be able to disconnect you remotely. And the promise of self-driving cars is the end of traffic jams - a wonderful prospect, but only if they’re all remotely controlled, and humans can’t direct the speed or route of the vehicle. What you may not know that the Google fantasy of engineers directing society, free from that messy democracy business, is not a new one. The man credited (by utopian socialist HG Wells) with coining the word "technocracy", Professor Miles Walker, lamented in 1932 that “politicians are not engineering-minded, and that is why they make a failure of state management”. 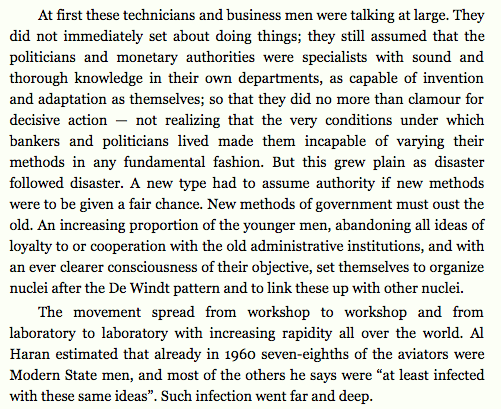 Screen grab of HG Wells' The Shape of Things to Come, a sci-fi book that looks back (from the future) on the rise of technocrats. Walker was part of a group of radical scientists and prominent public intellectuals, including molecular biologist JD Bernal and geneticist JBS Haldane, who called for a new colony of 100,000 scientists and engineers. This would be free from the “constraints and social errors” that non-engineers introduce - or non-engineers might wish to vote for. This is not so dissimilar to what Google, and other “Smart City” advocates want. Google wishes to take on more management functions either directly or through proxies such as Uber (Google is the biggest investor in Uber).